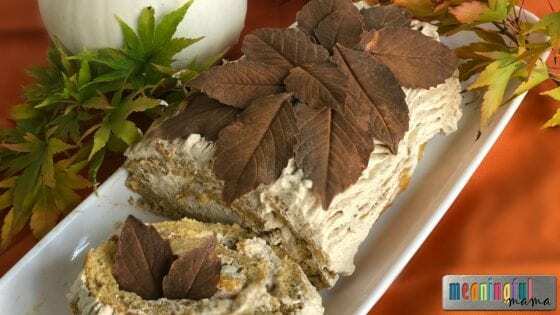 This Beautiful Pumpkin Spice Rolled Yule Log Cake for the Fall incorporates so many of the fall flavors you love, but presents those flavors in a sophisticated design that your guests will love. I know a yule log cake is traditionally a Christmas dessert item. I decided to re-make the idea to accommodate your autumn baking aspirations. Note: This is my pumpkin spiced whipped cream recipe, which is fabulous on hot chocolate, coffee drinks and other autumn desserts. 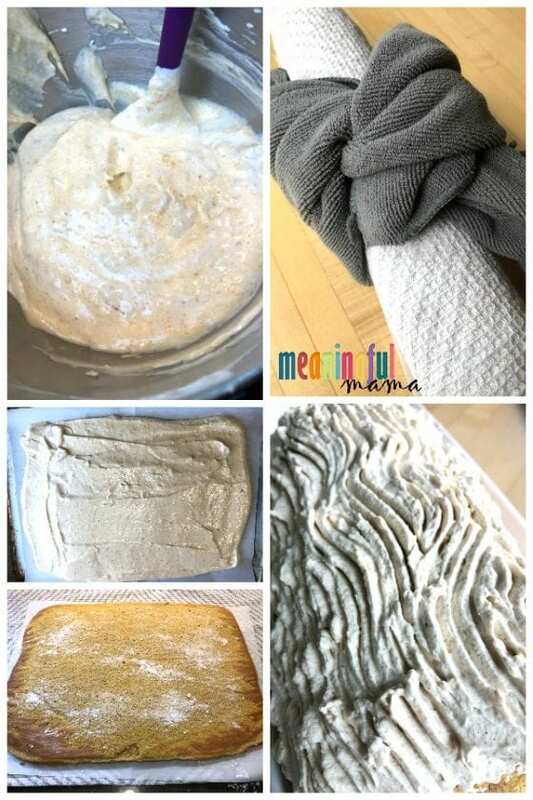 Line a jelly roll pan or cookie sheet with parchment paper . Sift the flour and cornstarch together. Add spices. Stir to combine. Separate the yolks from the whites. Place the egg whites and salt in a mixing bowl. Set the yolks aside in a medium bowl. On medium-high speed, whip the whites until they are just beginning to thicken and hold their shape. Gradually add the sugar and the vanilla. Beat for a minute until batter forms a meringue. It will be glossy and will hold form on your whisk. Whisk the yolks and the pumpkin puree until they are well blended. Scoop out 1/3 of the meringue. Combine with yolks. Whisk together until combined. Add what you just mixed on top of the remaining meringue. Don’t mix. Using a large spatula, gently fold all the ingredients together until full incorporated. Do not over mix. Scrape batter onto prepared baking sheet and spread evenly to make a large rectangle. Leave a 1 inch border around the edge. Bake for 8-10 minutes and is set to a light golden color. Do not let the finished cake sit for longer than a few minutes. Spread out a clean kitchen towel. Lay a piece of parchment paper on top of it. Dust parchment paper with powdered sugar. Turn over the pan to let the cake fall onto the parchment paper. Gently peel away the parchment paper. Allow to cool for one minute. Lightly dust the cake with powdered sugar. Lay a new piece of parchment paper over the cake. Roll up the cake tightly in the parchment paper and kitchen towel, starting at the short end. Tie another kitchen towel around the roll to secure. Then, let the cake cool to room temperature. 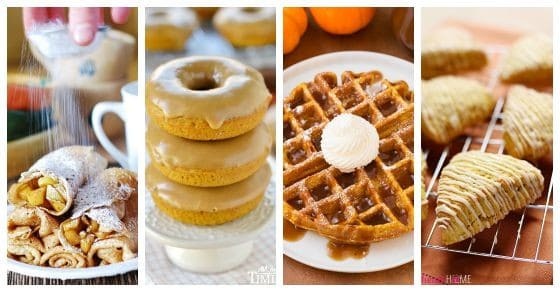 Whip the heavy cream, sour cream, powdered sugar, pumpkin and pumpkin spice in a medium bowl with an electric mixer on medium-high until stiff peaks form, 1-2 minutes. Once cooled, unroll the cake and remove the parchment paper. Reserve half of the whipped cream for the top. Spread the remaining whipped cream on the cake, leaving a 1-inch border along one of the short ends. Place the cake seam-side down on a serving platter. 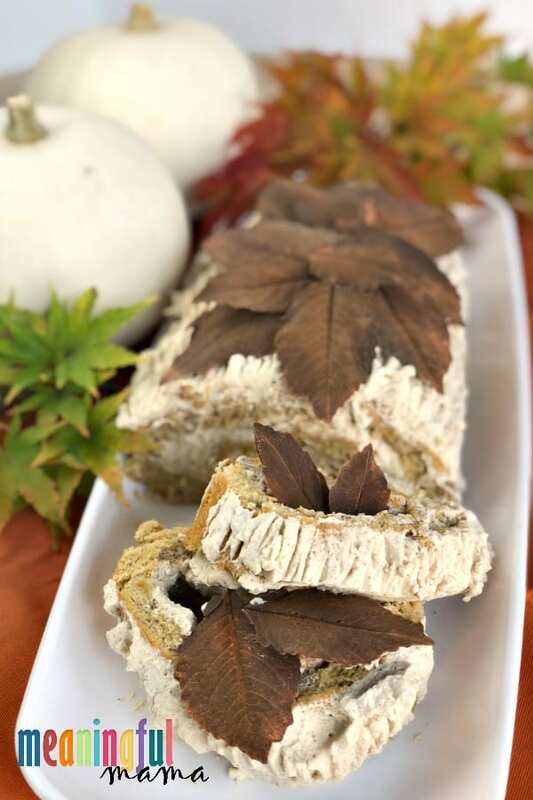 Spread the reserved whipped cream on top and use a fork to create a log-like pattern. Garnish your Beautiful Pumpkin Spiced Rolled Yule Log for the Fall with DIY chocolate leaves. They’re easier than you think. Just watch this quick video tutorial. 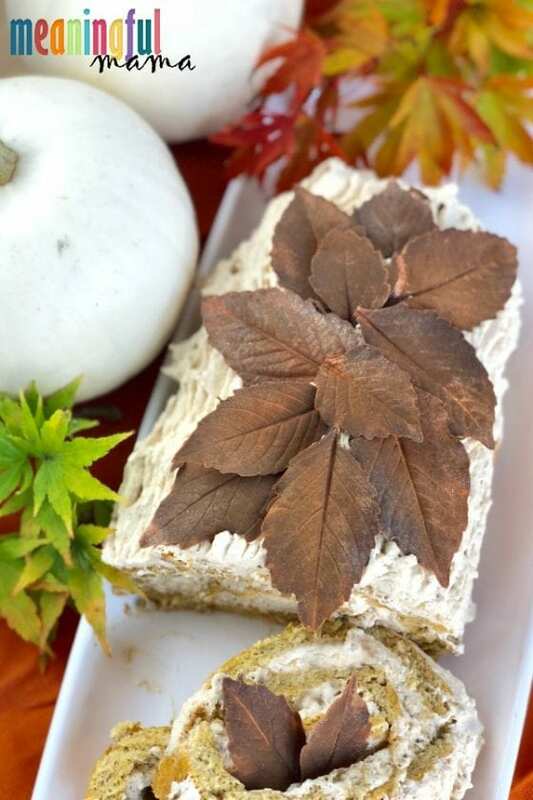 Your guests will be wowed with your chocolate leaves. However, they only take minutes to make. My girls, age 9 & 11 were able to make them. It’s a great garnish for even the most amateur bakers. You can also top with shaved chocolate, chopped nuts, or leave off the whipped cream and do a dusting of powdered sugar. You can also put the whipped cream into a piping bag with a tip and add a more intentional piped design. I don’t know your level of baking. Some people let words like “meringue” in a recipe intimidate them. Don’t let that happen to you! A meringue is basically a mixture of egg whites and sugar. This recipe adds vanilla into the mix. Some bake the meringue mixture to form baked meringues. Meringue mixture can also be incorporated into a recipe to bring a light texture to a dessert. A pie topping is another common usage of a meringue. What does a perfect meringue look like? It will be glossy white in color. 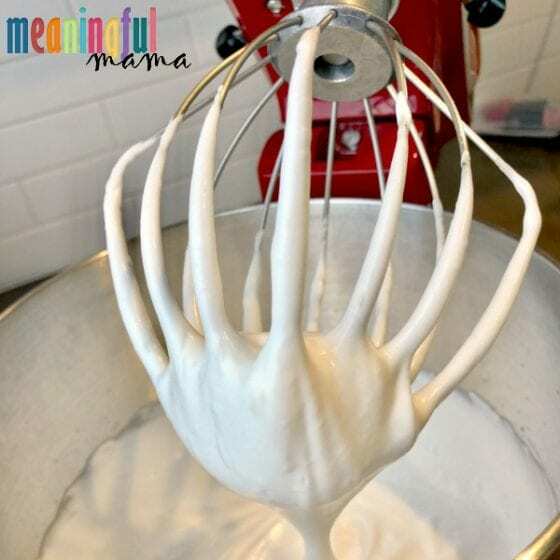 Meringues can have soft to firm peaks. I did medium peaks for this recipe. 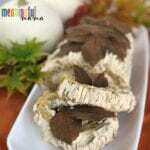 For a more in depth look at meringues, I find this post extremely helpful. 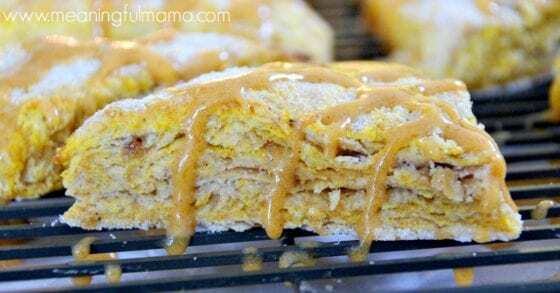 This beautiful and tasty autumn dessert with pumpkin spice is what you will want to be baking up this fall. Sift the flour and cornstarch together. Stir to combine. On medium-high speed, whip the whites until they are just beginning to thicken and hold their shape. Gradually add the sugar and the vanilla. Beat for a minute until batter forms a meringue. It will be glossy and stiff. Add what you just mixed on top of the remaining meringue. Do not mix. Using a large spatula, gently fold all the ingredients together. Fold until incorporated completely (especially the pumpkin), but do not over mix. Scrape batter onto prepared baking sheet and spread evenly to make a large rectangle. Spread out a clean kitchen towel. Lay down a piece of parchment paper. Dust parchment paper with powdered sugar. Turn over the pan to let the cake fall onto the dusted towel. Peel away the parchment paper. Lay a new parchment paper on top of cake. Roll up the short side of the cake tightly in the kitchen towel and parchment paper. Tie another kitchen towel around the roll to secure. Then, let the cake cool to room temperature. Spread the remaining whipped cream on the cake, leaving a 2-inch border along one of the short ends. Starting at the other short end, roll up the cake toward the uncovered border. Garnish with DIY chocolate leaves, shaved chocolate, chopped nuts, or leave off the whipped cream and do a dusting of powdered sugar. You can also put the whipped cream into a piping bag with a tip and add a more intentional piped design. 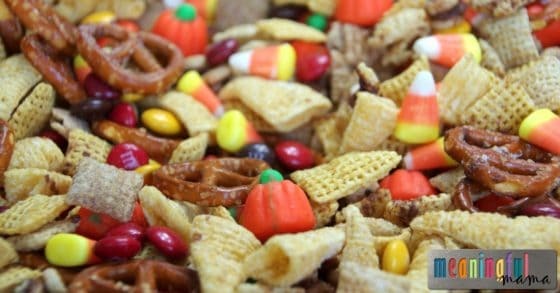 Want More Delicious Recipes Using Your Favorite Fall Flavors?